In the 18th in a series of posts from authors of 2018 books entered for The Story Prize, K.D. 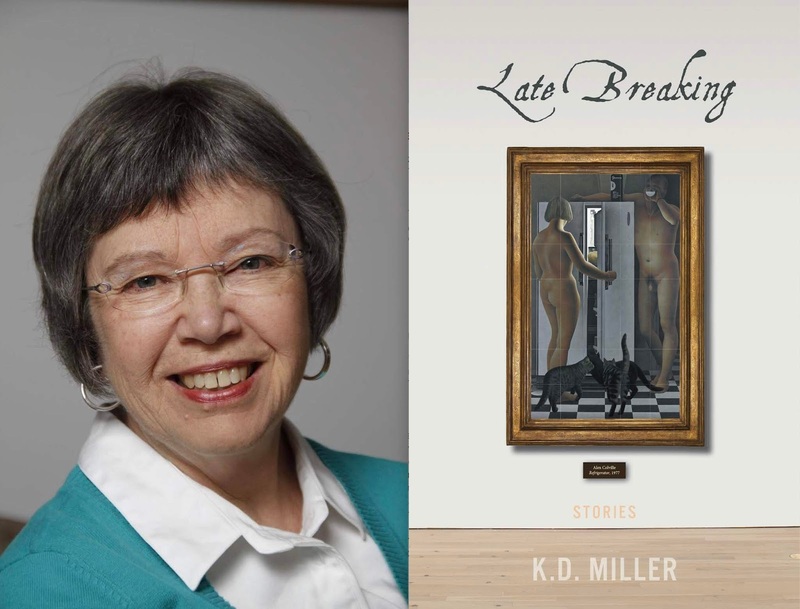 Miller, author of Late Breaking (Biblioasis), discusses her work habits and finding inspiration for her collection in an art exhibit. I am an early-morning writer and have been ever since I started to write seriously – almost 40 years ago. For 35 of those years, when I was working at a full-time day job, it was a matter of getting some writing in before I had to rush out the door. Now that I’m retired, I still wake early and carry my first cup of coffee to my desk. It’s about priorities, I guess—paying attention to what’s truly important before all the little banalities of the day start to intrude. My only rule is to show up, every morning without fail, and to be open to whatever happens. Sometimes nothing. Sometimes pages and pages of stuff. In some circles, this is called putting oneself in the way of grace. So I try to be there, just in case grace drops by. Late Breaking began with what I can only call an epiphany. In 2014, I attended the Alex Colville exhibit at the AGO (Art Gallery of Ontario). It was a rich, layered exhibition, linking the painter’s work with that of artists as disparate as Alice Munro and the Coen brothers. Why had I not seen the Alice Munro connection before this? Both creators pay meticulous attention to everyday detail—a dog’s raised paw; the seams of a summer dress. Colville’s invisible brushwork has its counterpart in Munro’s transparent prose. And of course, there is that ever-present sense of menace. No matter how tiny their focus, both artists capture something that looms. That impends. I was between projects when I visited the AGO. As I tend to do when I’m at loose ends, I was toying with the idea of writing a murder mystery. (Deep down, I still want to be P.D. James when I grow up.) Of course, what I found at that exhibit, in spades, was mystery. Every Alex Colville painting, like every Alice Munro story, is an endless corridor lined with doors just slightly ajar. As I roamed the rooms of the gallery, the phrase The Colville Stories formed in my mind. It became a mantra. The Colville Stories. The Colville Stories. I felt as if I could spend the rest of my life gazing into those paintings. Pulling stories out of them. Each of the ten stories in Late Breaking has a particular painting as its jumping-off place. I am delighted with the way Biblioasis has incorporated the visual works into the finished book. Years ago, when I was working, I had to attend a conference in Rochester, New York. I shared a hotel room with a colleague who, it turned out, snored like a buzz saw. Plus, she liked to sleep in. So there I was, creeping out of bed before dawn, tiptoeing past my roomie to the hotel room desk and somehow blocking out the noise in order to start my day the way I wanted to. I think that’s when I realized I was a writing junkie. Recently I heard myself telling a group of writers that at some point, I fall in love with whatever I’m writing, and at some point, the writing breaks my heart. The heartbreak can come of a sudden blockage or the sickening feeling that a character or subplot that you’ve tended to lovingly for ages simply has to go. I’ve found that the best thing to do is take a step back. Work on something else. Or just read. (Reading author autobiographies—especially the parts where they describe their own failures, is particularly helpful.) The point is to leave the beloved alone. Let it come back to you, if it will.